I first heard of the 101 in 1001 a few days ago when I read Mary's own list. After reading it, I immediately wanted to participate. It was the perfect combination of practicing gratitude by giving back, and carrying on with my Something New Challenge. It's also a great opportunity to work on my bucket list, since it comes with a deadline. Tasks must be specific (ie. no ambiguity in the wording) with a result that is either measurable or clearly defined. Tasks must also be realistic and stretching (ie. represent some amount of work on your part). 2. Have a white Christmas. 3. Try a pumpkin latte. 4. Pet a red panda. 5. Meet Anne in London. 6. Meet Liz in the UK. 7. Meet Aimee & Rebecca in the UK. 8. Make a snow angel or build a snowman. 9. Go to a poetry reading. 10. Attend a dance class. 12. Say yes to everything for an entire week. 13. Experience 5 star dining. 14. Set up a new blog. 15. Do a guest post. 17. Start up Etsy/Bigcartel shop. 19. Reach 1001 followers on Instagram. 20. Visit the Warner Bros. Studio Tour - The Making of Harry Potter. 21. Try macarons at Ladurée in Paris. 22. Attend a class at Alain de Botton's School of Life. 24. Shop at Kate Spade in Bicester Village. 25. Take photos from the London Eye at Sunset. 26. Go up the 500 steps to the Golden Dome of St. Paul's Cathedral. 27. Go to a "Late at Tate" event. 28. Watch a play at Shakespeare's Globe Theatre. 30. Take a stroll through Hyde Park. 32. Go to a spa in Bath. 33. Browse in Libreria Acqua Alta in Venice. 34. Experience Carnivale in Venice. 35. See the Notting Hill Carnival. 37. Return to the Louvre. 38. Attend the Hay-on-Wye Festival. 39. Go to Edinburgh for the Fringe Festival. 40. See the Eiffel Tower again, this time at night. 41. See the Greenwich & Docklands International Festival. 42. Attend evensong at Westminster Abbey. 43. Visit the fair city of Verona. 45. Take a cheesy photo at the Leaning Tower of Pisa. 48. See the Jurassic Coast. 49. Celebrate my 31st birthday in Disneyland Paris. 50. Watch "Mouse Trap" at the West End. 51. Visit the Weta Workshop in Wellington. 52. Drop by "221B Baker Street". 55. Finish my Mindfulness Journal. 58. Do the "Simplify. Structure. Succeed." workbook. 62. Get my full licence. 65. Try out a Hobonichi planner (available Sept). 68. Finish my 365 journal. 71. Complete my Sentence a Day journal for 2015. 72. Know how to use my DSLR in manual mode. 73. Complete a Photo A Day challenge in 2015. 74. Volunteer for a cause I care about. 76. Do 10 Random Acts of Book Gifting. 78. Leave $20 towards someone's groceries. 80. Pay for a stranger's morning coffee. 81. Do a random act of kindness in 3 different countries. 84. Reach my 2015 reading goal. 85. Read all the Discworld novels. 87. Try a beginner's yoga class. 88. Lose another 5 kgs. 90. Meditate daily for a whole month. 91. No chocolates/lollies/desserts for a week. 96. Reach my travel savings goal. 97. Have an emergency fund. 98. Complete a month-long "no spend" challenge. 100. Read 180 books in 1001 days. 101. Complete a 28-day "No Starbucks" challenge. Nice list and good luck! I like that you broke it up into different categories. Good idea. I started mine, but I am nowhere close to 101 yet. As far as learning German, I have a category on my blog where I keep track of some of the things that have helped me, although I'm nowhere near fluent. http://amandapoverseas.wordpress.com/category/a-lifetime-of-learning/language-learning/learning-german/ I still have a lot more entries I need to add to it in the future (German movies, translations of songs, dual language books, etc.). did you enter them all into the day zero project website? i liked the idea of this, but i feel like it's so much time and effort to be checking it off in another place.. that i just keep it on my blog. i don't know if the community on there is awesome and supportive and that's why people stay on there though. :) if i redo my this year, does that mean you've inspired me to make my own? I've got a wish list going on my blog - but I really love this idea. and you've definitely inspired me to make my own list! I just need some time to get my ideas together. It might be a project for 2014! I'm looking forward to seeing all the things you accomplish! Oh yay! That means I can cross off #83 right? ;) Yeah it took me a few days to get this list together too. I thought it was going to be pretty easy, but after about 40-something I really struggled. I did, but after doing it I actually thought, "What was the point of that?" >_< I'm seriously starting to question my time management skills. I'll just keep it on my blog, and maybe update on the day zero site if I ever remember. I can't wait for my next day off so I can just sit down and start planning/scheduling things that I can start on. Thanks hun! oh my goodness, I need to say hi to you! It's been a while! Hi Angela! I'm incredibly sorry for the late reply. Thank you so much for the award nomination! That's so kind of you. :) I wish you all the best with your own list! Thanks Susanne :) It's been 10 days and I haven't done much! I can't wait for the holidays so I can start planning and preparing. Anyway, I think I only managed to get to the point where I could order myself something at a restaurant and actually have an idea what I'd asked for, but that was about it. Fingers crossed I can motivate myself to keep going! You're welcome. I started learning in HS but the teacher mostly gave vocab worksheets and free time, which was fine at the time but not so much when I found out I was moving to Germany lol. I actually remembered quite a bit as I started practicing again but I still know more vocab words than how to use them. I'm happy if I can get through a restaurant order or shopping transaction without having to resort to English. Most of the rest of the conversations I've had have been someone speaking in German and me answering in English with them apparently understanding and asking me more in German so I guess at least it's not just me that understands more than I can speak lol. I know! That's why I got so annoyed at a customs guy who told me he didn't speak English, watched me make a fool of myself trying to mime and speak terrible German, and then effortlessly ask me in fluent English, "Yes, but what about that one?" He said it was funny to watch me mime and throw random German words into my sentences. HMPH! That's kind of mean lol. I know there are some who will say they only speak "a little" and then speak better than many Americans, but I've heard that's because they have to take a test in school and if they don't pass it they don't say they speak English. Those who do tend to say "of course' lol. I want postcards, woman! At least one from each country you visit! Did you have the list completely filled out with goals before you started the project? Haha, I'll try my hardest! Email me your address and I'll put you down in my book. I didn't start the project until I had a complete list, but I don't see why you can't start it before having a complete one. 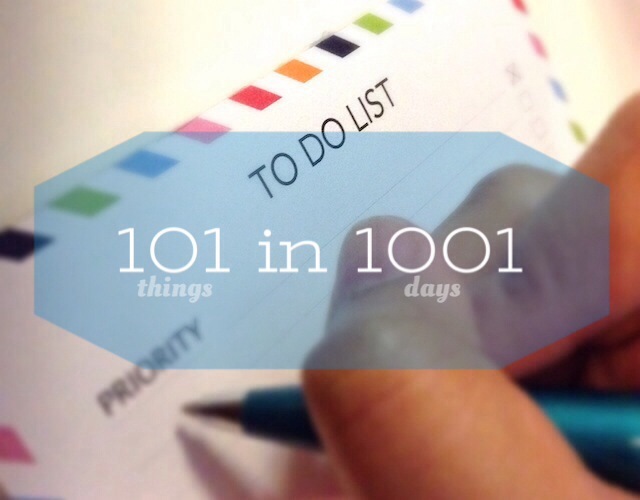 I'm pretty sure I saw some people write "Have a complete list of 101 things in 1001 days" as one of their goals. I read this the other day and you have inspired me to do this!! I am so excited!! I started it on March 15th! I'll put it up on my blog soon enough, I am just reconsidering some of my things because I think some are just wayyy too unrealistic LOL. This is such an awesome thing though! I feel like this is something to help me get through the couple of years when I am feeling down and unmotivated!